LM12, who is better known as Laddie, arrived at the nature reserve near Dunkeld at around 5.30pm on Friday. 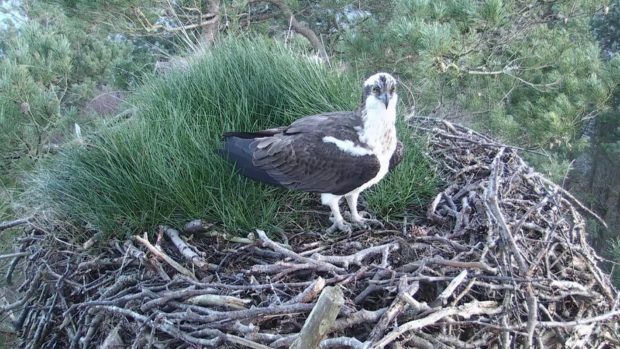 Staff, visitors and volunteers as well as webcam viewers around the world are now eagerly waiting to see if he will be joined by mate Lassie (LF15) for a fifth season – and if the pair will add to the ten chicks they have successfully fledged since 2015. Laddie was previously the mate of the Loch’s most famous osprey Lady. Sara Rasmussen, Perthshire ranger at the Scottish Wildlife Trust said: “LM12’s arrival after his long journey is an exciting moment and it marks the start of our 2019 season. We’re now keeping our eyes peeled for the arrival of his mate LF15, which could come any day now. “2019 is a particularly special year for the Trust because it is 50 years since ospreys first appeared on the reserve. At that time Loch of the Lowes was just one of a handful of places where ospreys could be seen, and we’re proud to have played a small part in inspiring their wider recovery in Scotland.